In early September, a group of British writers has visited Russia on a trip organized by the Russian Federal Agency for Press and Mass Communication, with support from the British Council. For an entire week, 10 English, Scottish and Irish authors took part in discussions, gave lectures, and went to the estates of great writers and artists. Memorable highlights of the trip included eating pancakes with caviar and seeing Chekhov's rather small bed. This literary expedition was by no means the first of its kind; in 2010, French writers traveled from Moscow to Vladivostok on the Trans-Siberian Railroad, while in 2013 writers from Italy visited famous places associated with Tolstoy, Turgenev and Bunin. 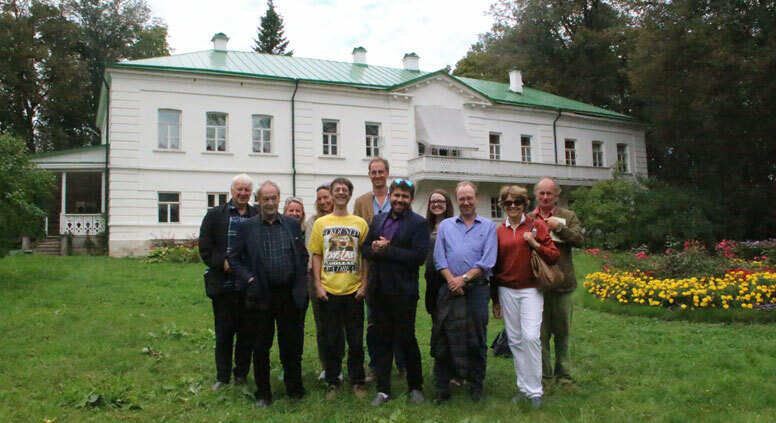 The itinerary for this year’s British guests was even more packed with attractions, however: they visited the famous estates of Abramtsevo, Muranovo, Melikhovo, Polenovo, Tarusa, Yasnaya Polyana and Spasskoye-Lutovinovo. These writers know much more about Russia than the average Englishman, and perhaps even more than some Russians. Among the visitors was Norman Stone, a scholar and Oxbridge professor who is a former adviser to Margaret Thatcher. In 1990, Stone published “The Other Russia,” a book about the fate of Russian émigrés. The writers’ delegation also included another historian, Alexandra von Tunzelmann, who authored a 2011 book about the Cuban Missile Crisis. This wasn’t the first trip to Russia for some of the guests. The group included Natasha Fairweather, a fluent Russian speaker and literary agent who lived in the country for four years, and Flora Fraser, an author of historical biographies who is a distant relative of Harold Pinter. There was also Nicholas Shakespeare – distant relative of the Shakespeare – a Royal Society of Literature Fellow who had an article published in Izvestia, a Soviet newspaper, in 1973. “It is hanging in a glass frame on my wall to this day,” says Shakespeare. The delegation’s organizers warned the writers not to forget warm clothing, as the weather in Russia is very changeable, but the group was unfazed. “Don’t worry,” visiting publicist Rachel Holmes assured them. “We’re from the UK – we always take a sweater, a rain jacket, and an umbrella wherever we go!” However, as the group left Moscow the sun came out, and the writers approached the first estate on a perfect day. Still, as he got off the bus, Nicholas Shakespeare pulled a fur-lined jacket over his long wool blazer and donned a felt hat. Bundled up like a character from “Doctor Zhivago,” he dwarfed the lean and nimble figure of the Irish writer and satirist Julian Gough. As he went over to Chekhov’s statue, Julian exclaimed, “He looks exactly like Alan Watts!” in reference to the famous British philosopher. And, barring the pince-nez, the two really are the spitting image of each other. In Polenovo, the British guests were welcomed by lunch, during which many of them tried buzhenina (cold boiled pork) with horseradish, and pancakes with caviar. Both dishes could very well have been served at the tables of classic Russian authors. The visiting writers were quick to ask about how to prepare the intriguing dishes, but the staff at the Polenovo museum managed to stave off their inquisitiveness and keep the recipe a secret. They did, however, treat the guests to a herbal tincture. Before leaving Polenovo, the writers took a swim in the Oka River. The swimming season has been long over for the locals, but the frigid water didn’t bother the British writers in the slightest; quite the opposite – they even enjoyed it. It was already almost evening when the writers headed to Tarusa. On the bus, the tour guide began reading Tsvetaeva in translation, but the group asked to hear the verses in the original. They were quite moved by what they heard and reflected on the amazing fact that she produced her work while living in total destitution. Not only was it Leo Tolsoy’s birthday when the writers visited Yasnaya Polyana, but the Indian summer continued as well. Abramtsevo is a museum estate located 37 miles northeast of Moscow. Owned first by writer Sergei Aksakov, then by merchant and patron of the arts Savva Mamontov, it was frequently visited by many great Russian artists and writers: Ilya Repin, Viktor Vasnetsov, Vasiliy Polenov, Mikhail Vrubel, Ivan Turgenev, Nikolai Gogol and many others. Muranovo, 30 miles north of Moscow, is the museum estate of the great 19th-century Russian poet Fyodor Tyutchev. The estate was a welcoming home to writers like Nikolai Gogol and Evgeniy Baratynsky. In 1920, Vladimir Lenin supported the creation of Tyutchev’s museum, founded by the poet’s grandson Nikolai Tyutchev. Melikhovo, 49 miles south of Moscow, is the museum estate of Anton Chekhov, who lived there with his family from 1892-1899. The museum was created in 1939 with the help of Chekhov’s younger sister, Maria. Polenovo, 80 miles south of Moscow, is the museum estate of the great artist Vasiliy Polenov, who lived there from 1892. The artist died in Polenovo and was buried on the estate’s grounds. Tarusa, 80 miles south of Moscow, is an ancient Russian town in Kaluga province. The poet Marina Tsvetaeva lived there as a child, and it has a house museum dedicated to her. There is also a cenotaph in Tarusa at the place where Tsvetaeva wanted to be buried. Yasnaya Polyana, 125 miles south of Moscow, is an estate in Tula province, famous for being the home of Leo Tolstoy and his family for many years. The current head of the museum estate is Vladimir Tolstoy, Leo’s great-grandson. Spasskoye-Lutovinovo, 205 miles south of Moscow, is an estate in Orel province that belonged to the family of Ivan Turgenev, who spend his childhood there and visited many times during his life. An earlier version of this text has an information that Mr Shakespeare had no relation to the great writer which is not true. Russia Beyond The Headlines apologizes to the readers and Mr Shakespeare.